Fire safety is of importance to the conscientious RV owner. Unfortunately, fire is one of the leading causes of RV loss in the U.S. today. 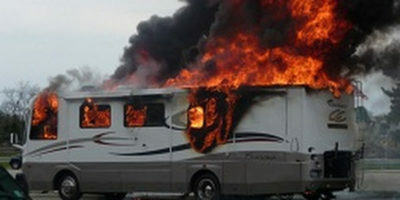 The National Fire Protection Association (NFPA) estimates that 20,000 RV fires occur annually. Don’t let yours be one of them! Make a pre-trip checklist and inspect your RV every time you hit the road. Have three fire extinguishers for your RV–one in the kitchen, one in the bedroom, and one outside in an unlocked compartment or in your tow vehicle. Make sure every traveler knows where they are located and how to use them. Have at least two escape routes and an escape plan. Practice it with your travelers. Make sure all travelers can open the front door, hatches, and emergency exits. Ensure that your RV’s carbon monoxide and propane detectors are properly located and functioning. Spontaneous combustion can occur in damp charcoal. Before you travel, buy fresh charcoal, keep it dry, and store it in a covered metal container. Ensure that the power cord for connecting your RV to a campground’s electricity supply is in good condition and of suitable gauge wire to handle the electrical load. Replace damaged cords immediately. Have your RV’s brakes checked. A dragging brake can create enough friction to ignite a tire or brake fluid. Bouncing down the road can loosen electrical connections, which can produce heat, and in turn, fire. Tighten them before your trip. Check all 12-volt connections before every trip. Many RV fires are caused by a 12-volt short. Leaking fluids in the engine compartment can ignite. During your pre-trip inspection, check all hoses for firmness, clamp tightness, and signs of leaking. Have repairs made before you travel. Mechanical or electrical failures cause roughly three-quarters of the highway vehicle fires. Proper maintenance will help reduce your chances of having malfunctions on the road. At each rest stop, give your tires at least an eyeball check. Remember, a pressure gauge reading on hot tires is NOT accurate. Be cautious of where you pull over and park. A hot exhaust pipe or catalytic converter can easily ignite dry grass underneath your RV. Never leave appliances that are plugged in and on unattended. Turn off overhead exhaust fans when you leave the RV. Don’t leave 12-volt lights on. Keep clothing and other burnable things away from them (like in storage spaces). They get very hot. If the flame on your galley stove goes out while in use, unless you have run out of fuel, the gas will continue to flow and could result in an explosion. Turn off the stove and air out the RV before trying to relight. Keep all combustibles–from paper towels to curtains–far enough away from your stove that they cannot catch fire. Gasoline and propane can pose an immediate, explosive danger. Deal at once with any leaks or spills, and use all fuels in adequately vented areas. Operate your generator in an area where gasoline fumes cannot reach an ignition source. Keep your campsite fire sources, such as fire rings, tiki torches, and lanterns, away from all vehicles. RVs often have a very limited number of electrical outlets, and sometimes RV owners use power strips to plug in more things. Don’t overload the electrical outlets! Circuit breakers don’t always prevent overloads from starting fires! It’s best never to use an extension cord in an RV. If you must, make sure you use a HEAVY DUTY extension cord, and make sure the load you put on it is well within its safe load capacity. DON’T run any electrical cord under a carpet or floor mat. The first step is to get everybody out of the RV and safely away from the fire. If it is a small fire and you can extinguish it without putting yourself in danger, put it out with a fire extinguisher. If it is too big of a fire or coming from an unknown source, do not risk your safety… Get out. Never re-enter a burning RV to retrieve anything–GET OUT & STAY OUT! Get help. ALL adults and older children should know how to dial 911. Remember that cell service may be limited where you are, so make a plan ahead of time. It’s crucial to know your exact location so firefighters can find you. Remember, safety is no accident. Happy Camping!